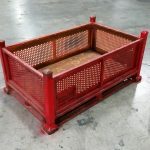 Item #931: (Lighter Duty) Steel Mesh Baskets 34.5″ x 40.5″ x 29″ o/h, 2 gates. 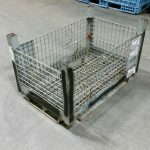 Item #930: Steel Collapsible Mesh Baskets 40″ x 45″ x 39″ o/h, (34″ ID). 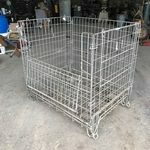 Item #922: Steel Collapsible Mesh Baskets, 32″ x 40″ x 36″ o/h, (28″ ID). 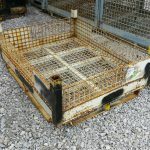 Item #919: Steel Mesh Baskets, OD: 96.25″ x 44.5″ x 50″ o/h, ID: 94″ x 41.75″ x 41.75″ ID, 2 gates. 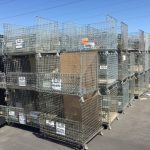 Item #917: Steel Mesh Baskets, OD: 68″ x 47.5″ x 22.5″ o/h, ID: 65″ x 44.5″ x 13.25″ ID, no gates. 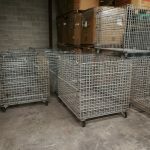 Item #915: Steel Mesh Baskets, OD: 58″ x 45″ x 24″ o/h, ID: 57″ x 44″ x 14″ ID, no gates. 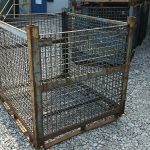 Item #914: Steel Mesh Baskets, OD: 58″ x 45″ x 22″ o/h, ID: 56.75″ x 43.5″ x 11.75″ ID, no gates. 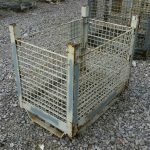 Item #913: Steel Mesh Baskets, OD: 58.25″ x 45″ x 25″ o/h, ID: 57″ x 43″ x 11.5″ ID, no gates. 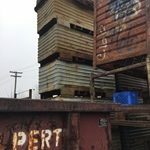 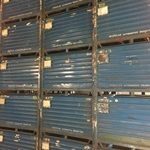 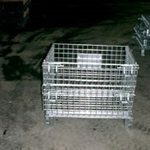 Item #912: Steel Mesh Baskets, OD: 57″ x 47.75″ x 50.25″ o/h, ID: 54.75″ x 46.5″ x 40.75″ ID, 2 gates on 47″ sides. 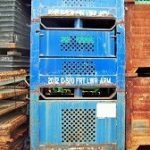 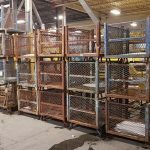 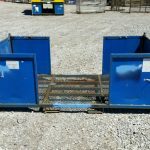 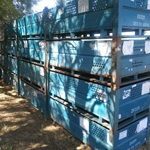 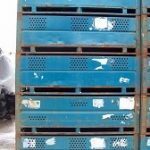 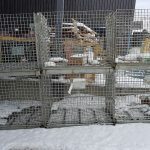 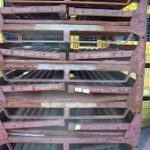 Item #911: Steel Mesh Baskets, OD: 54″ x 48″ x 38.25″, ID: 52.25″ x 45.5″ x 28.25″ ID, 2 gates on 54″ sides. 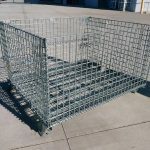 Item #910: Steel Mesh Baskets, OD: 54″ x 48″ x 37.5″ o/h, ID: 52.25″ x 46.25″ x 29″ ID, 2 gates. 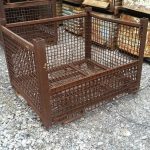 Item #909: Steel Mesh Baskets, OD: 54″ x 48″ x 30″ o/h, ID: 52.5″ x 46″ x 20.75″ ID, 1 gate. 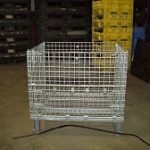 Item #906: Steel Mesh Baskets, OD: 53″ x 44″ x 38.5″ o/h, ID: 50″ x 41.25″ x 29″ ID, one gate on 53″ side. 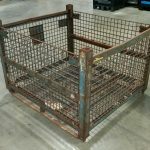 Item #905: Steel Mesh Baskets, OD: 53″ x 44″ x 38″ o/h, ID: 52″ x 42.5″ x 30″ ID, one gate on 53″ side. 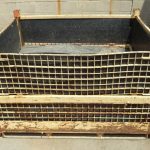 Item #904: Steel Mesh Baskets, OD: 53″ x 32″ x 36.25″ o/h, ID: 52″ x 31″ x 25″ ID, one gate on 53″ side. 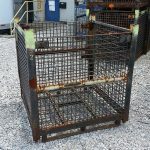 Item #903: Steel Collapsible Mesh Baskets, OD: 51.5″ x 44″ x 29″ o/h, ID: 49.25″ x 42″ x 21.5″ ID, 2 gates. 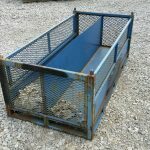 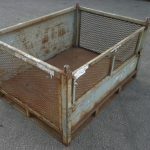 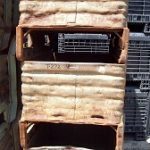 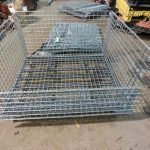 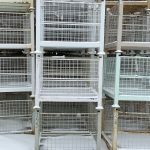 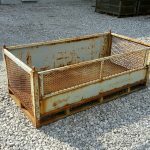 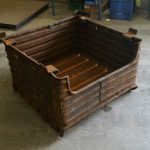 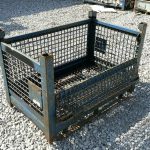 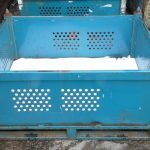 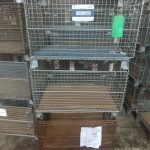 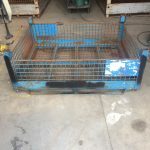 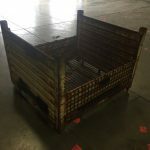 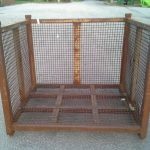 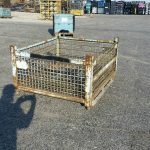 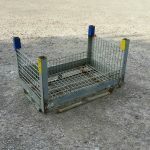 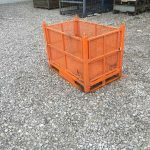 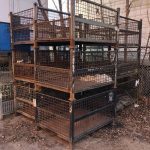 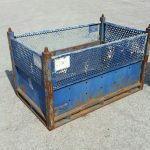 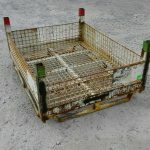 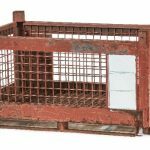 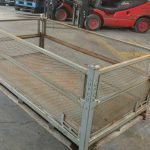 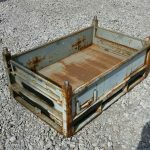 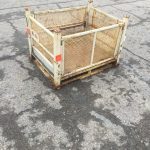 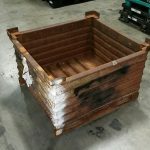 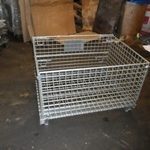 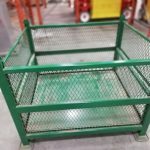 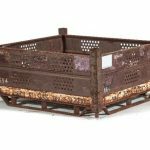 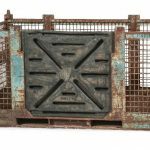 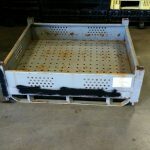 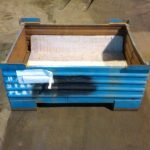 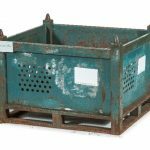 Item #902: Steel Collapsible Mesh Baskets, OD: 49.5″ x 40″ x 34.5″ o/h, ID: 47″ x 39″ x 28.5″ ID, one gate on 50″ side. 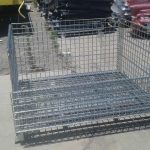 Item #901: Steel Mesh Baskets, OD: 48″ x 45″ x 50″ o/h, ID: 45.5″ x 43″ x 40.75″ ID. 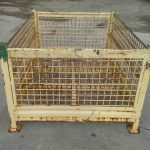 Item #899: Steel Mesh Baskets OD: 45.25″ x 29″ x 27.75″ o/h, ID: 44.5″ x 25.5″ x 18″ ID, no gates. 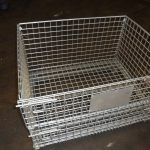 Item #898: Steel Mesh Baskets OD: 45″ x 29″ x 27.75″ o/h, ID: 43.5″ x 27.5″ x 17.5″ ID, no gates. 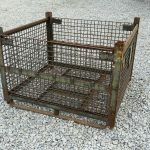 Item #872: Steel Collapsible Mesh Baskets 20″ x 32″ x 22″ o/h, (16″ ID), 1″x1″ mesh. 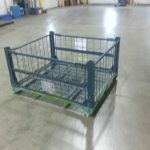 Item #870: Steel Collapsible Mesh Baskets on 4 Castors 39″ x 47″ x 45″ o/h, (39.5″ ID), 2.5″x4.5″ mesh. 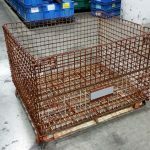 Item #869: Steel Collapsible Mesh Baskets 32″ x 24″ x 26″ o/h, (20″ ID), 2″x2″ mesh. 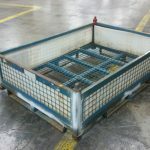 Item #868: Steel Collapsible Mesh Baskets 31″ x 39″ x 26″ o/h, (20″ ID), 2″x2″ mesh. 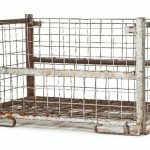 Item #866: Steel Baskets, Expanded Metal Sides, 4 gates, OD: 72.5″ x 37.5″ x 29.5″ o/h, ID: 68.75″ x 33.25″ x 21.25″ ID. 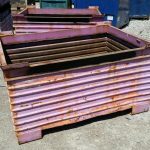 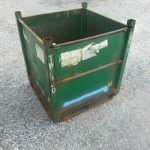 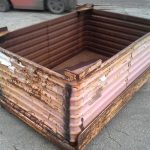 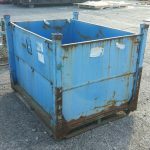 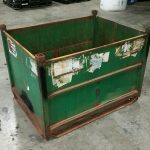 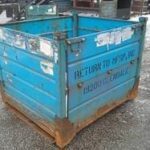 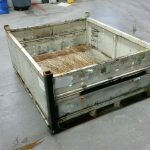 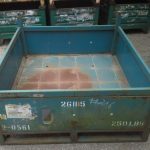 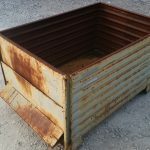 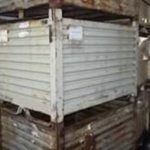 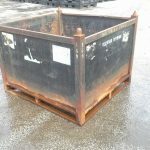 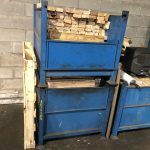 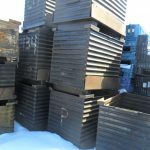 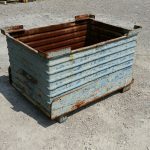 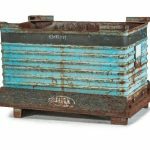 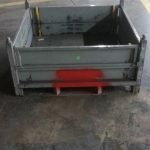 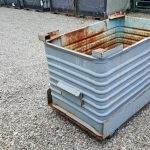 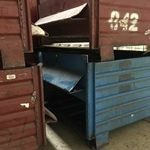 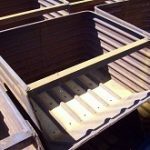 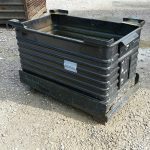 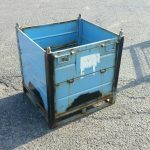 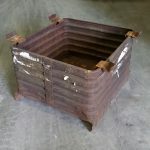 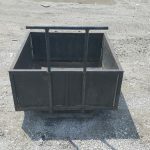 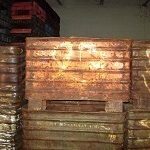 Item #859: Steel Drop Bottom Bins, OD: 51.5″ x 31″ x 36.5″ o/h, ID: 49.5″ x 28.5″ x 30.5″ ID. 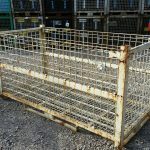 Item #832: Steel Mesh Baskets 41″ x 51″ x 31″ o/h, gate.